2201 Hempstead Turnpike, East Meadow, NY, USA. Citation: Baby AP, Hundal A, Aslam AD, et al. Rash Associated with Ibrutinib Therapy for Chronic Lymphocytic Leukemia. Skin Dis Skin Care. 2017, 2:19. Ibrutinib is used in the treatment of chronic myeloid leukemia. While patients taking the drug have developed rashes, there are few case reports and studies documenting this adverse effect. We present a case of rash associated with Ibrutinib therapy in a patient with chronic lymphocytic leukemia. Ibrutinib is a Bruton Tyrosine Kinase (BTK) inhibitor used for the treatment of chronic lymphocytic leukemia, mantle cell lymphoma, Waldenström’s Macroglobulinemia and refractory B cell lymphoma [1-7]. Skin and subcutaneous tissue disorders have been mentioned as some of the adverse effects of the drug, which were seen in up to 32% of the patients [4,5,8]. We present a case of rash associated with Ibrutinib therapy. 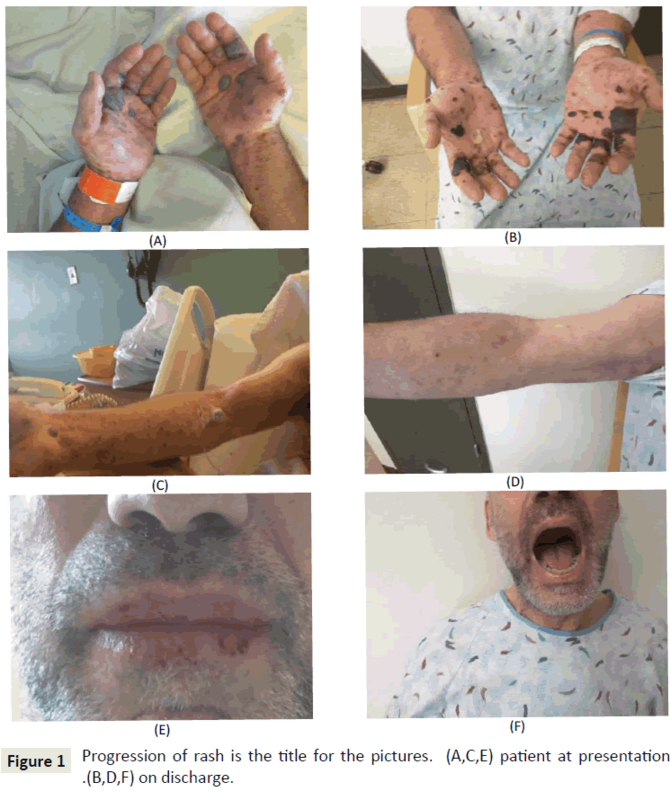 A 59-year-old Caucasian male was referred to the emergency department by his primary care physician for a rash involving skin, palms and oral mucosa. He initially noticed the rash 5 days prior and visited his doctor, who diagnosed him with varicella zoster and started him on oral acyclovir. However, he returned back to the clinic 2 days later as the rash worsened. The rash initially appeared on the palms as mostly reddish raised lesions. Later, he noticed some black colored blisters. More lesions started to appear on the trunk of the body, lower extremities, as well as around his mouth. He experienced pruritus in the areas where the rash developed and had difficulty eating because of the lesions on his lips. There was also associated swelling of the lips and bilateral hands. He was working outdoors 2 days prior to the appearance of the rash, but denied any changes to the rash with exposure to sunlight. He denied fever, weight loss, pain in joints, swelling of joints, pain on the rash, cough, rhinorrhea, and discharge from the eyes. He had not traveled or been exposed to any sick contacts recently. There were also no new medications, clothes, exposure to chemicals, cosmetics or new food items. He had no history of similar rashes, allergies in the past, or family history of skin disorders. Past medical history was significant for carcinoma of thyroid, chronic lymphocytic leukemia and depression. He has had a complete thyroidectomy with lymph node dissection in 2007, bilateral hip replacement and hernia repair. He denied drinking alcohol, smoking tobacco or using any recreational drugs. Home medications included Ibrutinib 420 mg daily, Zyprexa 15 mg daily, Unithyroid 200 mcg daily, and Depakote 500 mg daily. He has been on Ibrutinib for CLL for the last 2 years, and had tolerated it well without any major adverse effects. Upon physical examination, he appeared nontoxic, afebrile and hemodynamically stable. Skin examination revealed a generalized maculopapular rash over the entire upper and lower extremities, back and chest. His palms had multiple hemorrhagic bullae. His hands and lips were swollen. The lips were very dry with mucosal break. No lesions were seen inside the mouth. There was one open blister on the heel of the right foot. The pictures of the rash before (A, C, E) and after treatment (B, D, F) are shown in Figure 1. Examinations of all other systems were normal. Figure 1: Progression of rash is the title for the pictures. (A,C,E) patient at presentation . (B,D,F) on discharge. Laboratory tests showed a low platelet count of 111, with the rest of the complete blood count and chemistry within normal limits. The blood culture, hand foot mouth diseases serology and viral serology were negative. The patient was admitted to medicine floor. He was started on IV Acyclovir and continued to be on it until all possible viral etiologies were ruled out. Department of Infectious Diseases and Oncology were consulted for expert opinions. As both the specialties opined that the cause of the rash was most likely Ibrutinib, it was discontinued. He was started on IV steroids and antihistamines. A skin punch biopsy result showed superficial and deep perivasculitis with lymphocytes and eosinophils. Minimal spongiotic changes in epidermis were noted. The differential diagnosis includes drug reaction, insect bite and less likely, immune bullous disorder. The rash started to become less prominent and bullae reduced in size in the next three days. Some bullae burst open, releasing blood. Antibiotic coverage was given to prevent superimposed infection, and the skin was healing without any evidence of infection. The rash became less pruritic. The swelling of the lips and hand subsided. He was able to tolerate food. He was discharged with follow up appointments with his private oncologist. Ibrutinib is a kinase inhibitor indicated for the treatment of Mantle cell lymphoma, Chronic Lymphocytic Leukemia (CLL)/ Small Lymphocytic Lymphoma (SLL), Chronic Lymphocytic Leukemia (CLL)/Small Lymphocytic Lymphoma (SLL) with 17p deletion, and Waldenström's Macroglobulinemia (WM) [2-7,9]. A database search showed one single center experience  and one case report  of rashes associated with Ibrutinib. The conclusion of the single center study was that the late onset non palpable rash was mild, which required no dose adjustment of Ibrutinib, whereas the early onset palpable purpuric rash varied in severity and resulted in temporary discontinuation of the drug . The rash described in the case report  were edematous papules with peripheral-to-central pattern of spread is similar to that in the patient we have presented here. The differences between the rashes already reported and the rash in our patient is that the median time of onset of the rashes described were 15 days and 80 days of drug initiation for palpable and non-palpable rashes respectively and they were mostly purpuric , whereas in our patient it was 2 years after initiation of treatment and he had multiple hemorrhagic bullae which have not been described in the single center study , the case report , or other studies [8,10,11]. As the number of cases being treated by Ibrutinib is increasing, and as there are more patients who are on it for longer time, the identification of similar rashes will be helpful in formulating guidelines for the identification of various types of rashes associated with Ibrutinib, their appropriate management, and to determine when drug discontinuation is indicated. Written consent for the use of clinical photos was signed by the patient. Iberri DJ, Kwong B, Stevens L, Coutre SE, Kim J, et al. (2015) Ibrutinib-associated rash: single-center experience of clinicopathologic features and management. Blood 126: 4860-4860. Advani RH, Buggy JJ, Sharman JP, Smith SM, Boyd TE, et al. (2013) Bruton tyrosine kinase inhibitor Ibrutinib (PCI-32765) has significant activity in patients with relapsed/refractory b-cell malignancies. J Clin Oncol 31: 88-94. Chanan KAAA, Cramer P, Demirkan F, Fraser G, Silva RS, et al. (2015) Ibrutinib combined with bendamustine and rituximab (BR) in previously treated chronic lymphocytic leukemia/small lymphocytic lymphoma (CLL/SLL): First results from a randomized, double-blind, placebo-controlled, phase III study. J Clin Oncol 33: LBA7005-LBA7005. Byrd JC, Brown JR, O'Brien S, Barrientos JC, Kay NE, et al. (2014) Ibrutinib versus of Atumumab in previously treated chronic lymphoid leukemia. New England Journal of Medicine 371: 213-223. Byrd JC, Furman RR, Coutre SE, Flinn IW, Burger JA, et al. (2013) Targeting BTK with Ibrutinib in relapsed chronic lymphocytic leukemia. NEJM 369: 32-42. Wilson WH, Young RM, Schmitz R, Yang Y, Pittaluga S, et al. (2015) Targeting B cell receptor signaling with ibrutinib in diffuse large B cell lymphoma. Nat Med 21: 922-926. Treon SP, Xu L, Hunter Z (2015) MYD88 mutations and response to Ibrutinib in Waldenström's Macroglobulinemia. NEJM 373: 584-586. Farooqui MZH, Valdez J, Martyr S, Aue G, Saba N, et al. (2015) Ibrutinib for previously untreated and relapsed or refractory chronic lymphocytic leukaemia with <em>TP53</em> aberrations: a phase 2, single-arm trial. Lancet Oncol 16:169-176. Mannis G, Wu D, Dea T, Mauro T, Hsu G (2015) Ibrutinib rash in a patient with 17p del chronic lymphocytic leukemia. Am J Hematol 90:179. Levade M, David E, Garcia C, Laurent PA, Cadot S, et al. (2014) Ibrutinib treatment affects collagen and von Willebrand factor-dependent platelet functions. Blood 124: 3991-3995. Wang M, Rule SA, Martin P, Goy A, Auer R, et al. (2015) Interim results of an international, multicenter, phase 2 study of Brutons Tyrosine Kinase (BTK) inhibitor, Ibrutinib (PCI-32765), in relapsed or refractory Mantle Cell Lymphoma (MCL): durable efficacy and tolerability with longer follow-up. Blood 120:904-904.